Looking for a way to make mashed potatoes more special for the holidays? 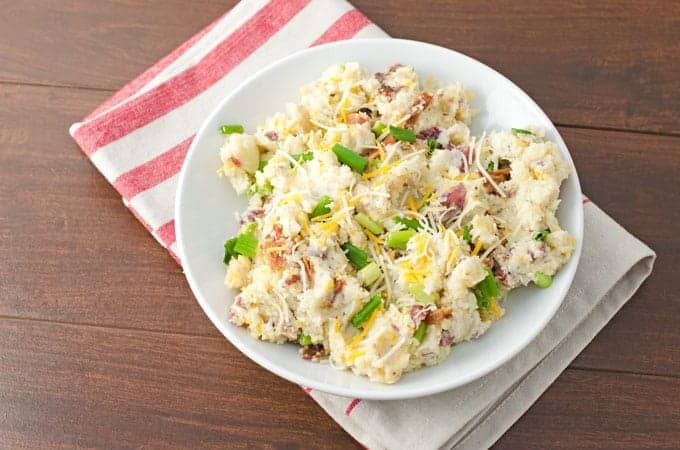 Check out this Loaded Smashed Potatoes recipe that is packed full of flavor. 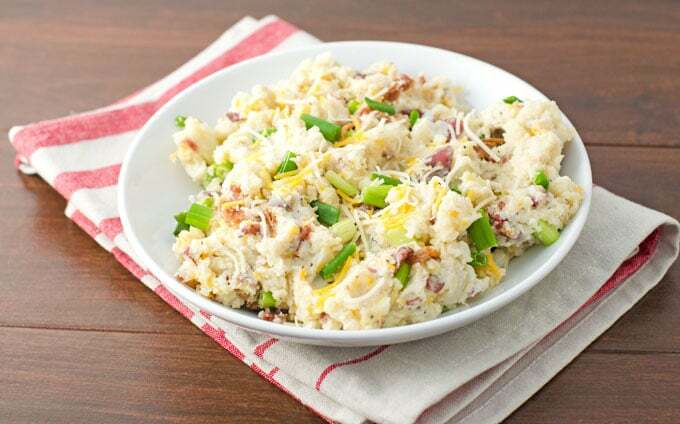 Like many, mashed potatoes have been one of my favorite side dishes since I was a kid. They’re easy to make, come together pretty quickly, and use frugal ingredients while being a dish the whole family loves. As good as they are, though, I do sometimes get tired of having them the same old same old way. I also get so very tired of peeling potatoes. So, every now and then I’ll make this loaded smashed potatoes recipe to change things up a bit. 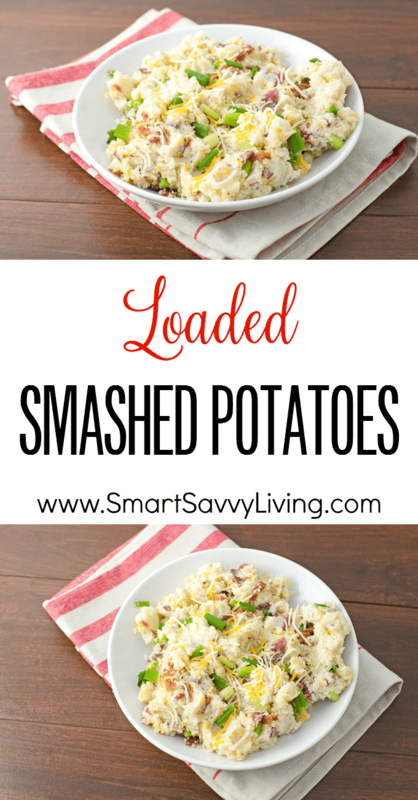 These loaded smashed potatoes are super easy to make. I especially love that you don’t even have to peel the potatoes. Yes, I know I just mentioned that, but it’s one of my least favorite food prepping chores even though I’ve been cooking for over 20 years. I call them loaded because they’re full of all the flavors you usually find in a loaded baked potato: butter, sour cream, cheese, and bacon. They’re so full of flavor and hearty that I’ll even admit I sometimes eat them as dinner by themselves. Since I leave the skin on when making these smashed potatoes, I don’t worry about making them super smooth and just mash them up with a potato masher. While they may not look super gourmet, they are rather rich, so I like to serve these loaded smashed potatoes on holidays like Thanksgiving or special occasions such as to go with a birthday steak. Here’s how I put them together. This section contains affiliate links which means if you click on one of the links below and make a purchase, we may earn a commission fee. All products listed below have been tried and true tested by us and are used regularly in our own kitchen. Thanks for your support! A scrub brush dedicated to potatoes and other veggies. I don’t really like the idea of using one I use to wash dishes. A large, good quality pot. Yes, you can get pots for cheaper than this, but these dutch ovens last next to forever and you can boil, braise, roast, and more on pretty much all surfaces. A large strainer or colander. Great mashed (or smashed) potatoes require a well-drained potato. A potato masher. These are also great for breaking down ground meat while it cooks and smashing berries. These super rich loaded smashed potatoes are the perfect side dish for holidays and special occasions. Thoroughly scrub potatoes clean and then cut into equally sized chunks, cutting out any imperfections or bad spots. There's no need to peel unless you want to. Place potato chunks into a large pot and cover with cold water. Add about a tablespoon of salt and stir, then place over medium-high heat. Cover the pot, bring to a boil, and cook until potatoes are fork tender. 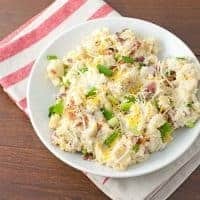 While potatoes cook, chop up bacon and green onion into bite-sized pieces and set aside. Once potatoes have cooked, drain thoroughly. Put the pot you cooked the potatoes in back on the stove over low heat and add butter. Add the drained potatoes and begin to mash with a potato masher. Once potatoes start breaking down add in sour cream and continue mashing until the desired consistency. If potatoes are too thick for your liking you can add more sour cream, cream, or milk. Stir in bacon, green onion, and cheese, and salt and pepper to taste. Potatoes can take a lot of seasoning so I start with 1/2 teaspoon salt and 1/4 teaspoon pepper. Top with garnishes as desired. These potatoes can be made the day before and warmed up covered in the oven in a casserole dish. You can also add any herbs for extra flavor or use chives instead of green onions.